Kindly note: The Front-end Course Creation plugin is an extension to LearnDash and BuddyPress. You will need to install and activate both these plugins to use FCC. Upon purchasing the Front-end Course Creation plugin, an email will be sent to the registered email id, with the download link for the plugin and a purchase receipt id. Download the plugin using the download link. Go to Plugin-> Add New menu in your dashboard and click on the ‘Upload’ tab. Choose the ‘frontend-course-creation.zip’ file to be uploaded and click on ‘Install Now’. After the plugin has been installed successfully, click on the Activate Plugin link or activate the plugin from your Plugins page. 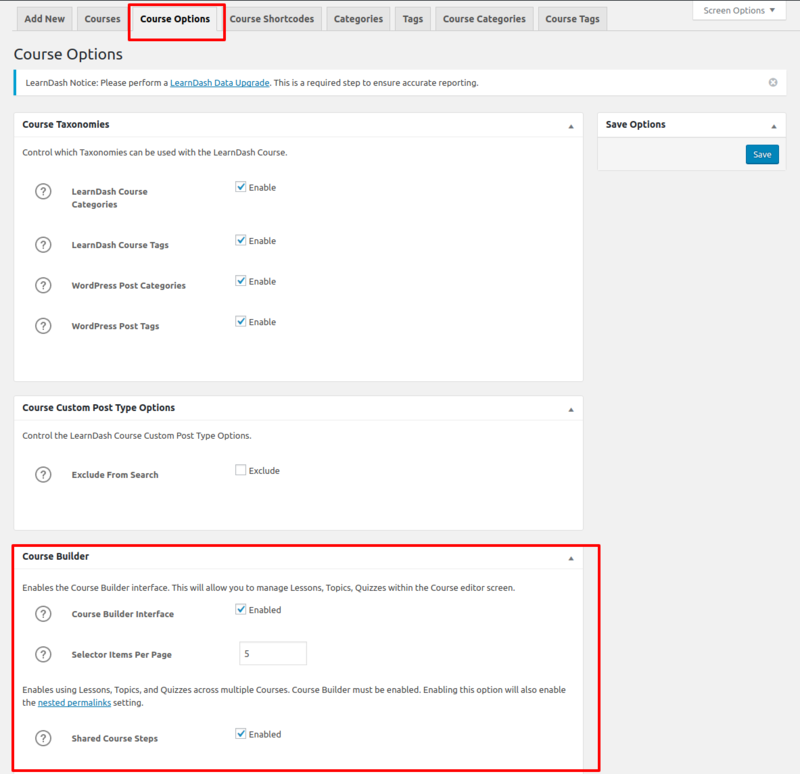 Upon entering a valid license key, and activating the license, you will find a ‘Course Author’ user role created, and ‘Course Creation Settings’ menu added to LearnDash settings. Upon installing and activating the Front-end Course Creation plugin for LearnDash, a ‘Course Author’ role is added, and course content creation pages are auto-generated. To create a Course Author, add a new user by heading over to Users->Add New, and set the user role as ‘Course Author’. Under LearnDash->Settings, you should notice a ‘Course Creation Setting’ tab added. Under this tab, you have the option to auto-publish course content added by ‘Course Authors’, or save the content as drafts. Remember to click ‘Save Settings’ once any changes have been made. Course Content Creation Pages: Allows a ‘Course Author’ to create Courses, Lessons, Topics, Quizzes and Add Quiz Questions. Course Management Pages: These pages allow Course Authors to view the course, lessons, topics, quizzes and questions they have created and make any changes using the ‘Edit’ option. The course author would get the commision once the Order status is completed. The commision would be provided only once regardless the status of the order is changed multiple times after once it is completed. On a purchase of the product which has multiple courses, the commision for the first course would only be credited to course author. On a purchase of a product which has multiple courses with multiple course authors, the commision would only be credited to the course author whose course is first in the list of courses. The plugin provides a quick link option ‘Listing’ right from the Course Author’s BuddyPress profile page to allow course content to be created and managed. You can also view/edit associated lessons and quizzes for a course. Similarly, you can view/edit associated topics and quizzes for a lesson. You can delete a particular course, lesson, topic etc. and restore it. Now Instead of going to different pages and creating lessons, topics and quizzes you can create these course contents under a single tab called ‘Course Builder’ on the Course Creation page on the Frontend. You can edit the content for the newly created Lessons/topics/quizzes under their respective Listing page. The newly created course contented will be displayed under this tab on the Course/topic/lesson Creation page on the Frontend. If you select the Select Shared Steps option it allows lessons, topics, and quizzes of Course A to be shared across multiple courses. This course content of a particular course will be seen under the course builder tab of other courses. Under your LearnDash LMS you should notice a ‘Course Author Commission‘ menu. Under this menu, you should find the settings to award Course Authors a percentage commission. Under the ‘Commission Report’ tab, you can view the commissions earned by a Course Author. You can export the commission report for all Course Authors or individual authors, using the ‘Export’ tab. The LD courses can be purchased as WooCommerce products. The commissions will be added for WC orders however, commission payment is still a manual process. New: Translation for some new strings is added in this update. Improvement: Added Support for Video Progression feature for Lessons and Topics. Fix: Course Author will need to filter quizzes by name or associated course. Fix: Course Author should not check “Different points for each answer” field for Essay type Question. Support for LearnDash Post Specific Categories and Tags. Provided options for setting both the LearnDash as well as WordPress categories and tags in the course, lesson and topic add/edit page. The categories and tags options will be displayed based on the setting in the backend. Provided setting in the quiz edit page to set the featured image of the quiz. Link to move a course, lesson, topic or a quiz into the trash and later changed to restore. Link to view the courses, lessons, topics and quizzes. Link to list all the lessons and quizzes associated with the course in the all courses table. Link to list all the topics and quizzes associated with the lesson in the all lessons table. Link to list all the questions in the quiz. New: Displayed “Associated Contents” section in each course, lesson, topic and quiz edit page. New: Added button to remove questions from the quiz. Improvement: Optimized the existing code and changed the previous approach of storing data in order to avoid the data duplication. Improvement: Removed the Questions tab and provided links to view and add/edit question from the quiz edit page. So the navigation becomes faster. Improvement: Added Compatibility as per quiz setting for Message with the correct/incorrect answer on question add/edit page. Improvement: Updated filters on Question listing page now we can filter questions by name, question type and question categories. Fix: Added categories option in the quiz add/edit page. Fix: Added option for View Profile Statistics in the quiz add/edit page. Fix: Fixed the add media for answers issue in questions. Fix: Fixed the Quiz-summary field saving issue in the quiz add/edit page. Fix: Fixed the Fill in the Blank questions different points for each answer issues for multiple answers. Fix: Added Hide Course Content table field on course add/edit page.